Angus Training Group Ltd comprises of a number of companies in many aspects of manufacturing who have combined for training purposes to give a high standard of industrial training. Technological progress and innovation has called for a new breed of engineering craftsmen and technicians carefully trained to reach a high standard of competence . 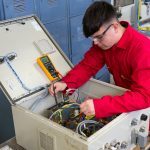 In order to reach the high level required, each apprentice is given thorough and intensive training in the Basic Engineering skills & specialised training in their employer’s chosen discipline. The training follows the Science, Engineering and Manufacturing Technologies Alliance (SEMTA) standards. On successful completion of the foundation-training pe riod, each successful apprentice will gain a Level II Scottish Vocational Qualification. Thereafter, on satisfactory completion of the work-based training, a Level III SVQ will be achieved. This, along with an appropriate Further Education award & Core skills will result in the apprentice achieving a Certificate of Modern Apprenticeship. Each trainee follows an appropriate day release course at an F.E. College which commences in the First Year of Training and continues in 2nd year.